Bottles released by the Scotch Malt Whisky Society (SMWS) will no longer be available to non-members, following feedback from members. As well as offering exclusive bottlings of single cask, single malt whisky to its members, the globally-operated whisky society has also offered a ‘sample subscriber’ membership, allowing non-members to purchase bottlings at a 30% price premium. However, to ‘preserve the exclusive nature’ of the society, the SMWS revoked the option for non-member purchases on 26 September. The change in rules follows the SMWS’ ‘most extensive’ survey of its members this summer. 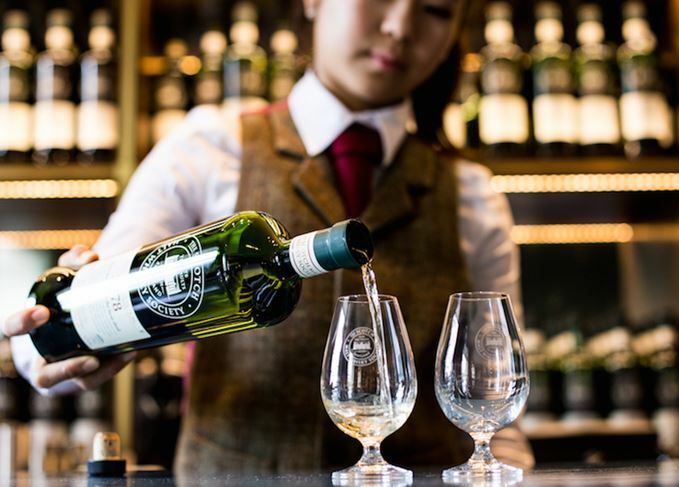 According to the SMWS, members felt ‘one of the most valued benefits of being a member of the Society was… to have exclusive access to exceptional single cask whiskies’. The change follows the launch of several new initiatives in recent months, including a range makeover, the introduction of a new rare whisky series, as well as a range of other single cask spirits such as rum, gin and Cognac. Non-members will now only be permitted to purchase special gifting items such as gift memberships and tasting glasses. Venues that permit non-members to visit – Kaleidoscope at Devonshire Square in London and 28 Queen Street in Edinburgh – will only allow the sale of bottles following a period of member-exclusivity. Basic annual membership costs from £61.50, and includes exclusive rates for bottle purchases as well as access to member venues around the world. The SMWS was founded in Leith in 1983, and today operates member clubs in 17 countries. The colourful new look for the Scotch Malt Whisky Society’s bottlings puts age and flavour first.